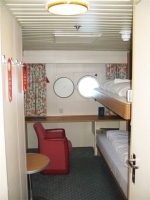 These cabins is for couples, or good friends, and has two beds arranged in bunk beds. All of these cabins has a window and this will give you some view and a bit of light. Bathroom with shower and toilet. Notice that many of these cabins are well situated which gives you easy access to the restaurant, demonstration deck and more. It is possible to fold away the upper bed during daytime to get more room. Check out the deck plan for details.